Do you or your family have any food or drink recipes that’s a holiday tradition to make? From a favorite dish, to a great punch, all the way down to a one of a kind dessert, the holidays bring out the best in us. We all have that one thing we like to make, or look forward to someone in our family bringing to Thanksgiving or Christmas dinner. For me, growing up in the Midwest there’s no more traditional holiday favorite than eggnog. It’s creamy, it’s sweet, and it’s great to sip on in front of a fire on a cold night. Growing up, you couldn’t convince me there was anything better. Our family was buying it and/or making it for years. Then I moved to Florida, got married, and had my eyes opened to a whole new world by my father-in-law. He told me about this great drink that the men and women in his country (Puerto Rico), would make around the holidays and share. Sweet, creamy, delicious, sounded like egg nog to me. So when I finally tried it, wow, I couldn’t believe what I’d been missing all this time. It was like a coconut eggnog! It made so much sense too that a tropical place like PR would have a drink similar to egg nog, but with an island twist. Ever since then, we’ve had a bottle of egg nog AND coquito at the table every Christmas and Thanksgiving. Today I’m sharing that recipe with you. Now since my first time trying it, I’ve searched high and low for recipes trying to get that perfect tasting Coquito. Some are too sweet, some too thick, some too cinnamon-y, and some just too strong in alcohol. After trying over 10 different recipes, and tweaking my own several times, I’ve come up with that I call, THE BEST COQUITO RECIPE EVER! Ok. That might be stretching it, but I love it, everyone that tries it loves it, and so I’m sticking with that. Now, if you’re from PR or your family makes coquito, or you have seen recipes online, remember; there is no “real coquito recipe” or “real Puerto Rican coquito” recipe. You fly down there and ask for some from 10 different families, and you’ll get 10 slightly different variations. The same basic ingredients are involved in most, but with slight differences in measurements, and added spices. 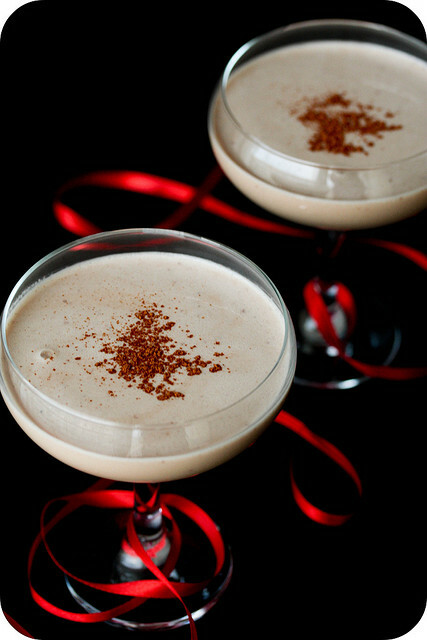 Here’s how to make a coquito, our way. Directions: Combine you canned ingredients and rums in a blender and blend well. Next add in your vanilla extract and cinnamon now blend again. Pour into large pitchers or screw cap bottles for storage. Add one cinnamon stick and one vanilla bean into your bottle and store in the refrigerator to chill for 2 hours. *Note: We have a large Ninja blender (Get one, you’ll thank us later) that is able to accommodate all these ingredients. If your blender is smaller, feel free to cut this recipe in half and make it in two waves in your blender. Love your recipe thanks for sharing! !